When 16-year-old Re'Shov was asked what he might want to put a smile on his face and make all of his basketball dreams come true, he said he wanted to see the Detroit Pistons court. When he got up Tuesday morning, he thought that's what he was going to The Palace to see. Re'Shov had no idea that was just a small piece of it. He got loads of news gear, a tour of the locker room and he even got to help out at Pistons practice and chat with some of his favorite players. "I don’t think any normal kid, ordinary kid,would know how to react to all this," said Re'Shov. With the smile plastered on Re'Shov's face Tuesday morning, you would never guess that he's been through more than most of us will ever have to go through in our lifetimes. He's been in the foster care system since 2007. This summer his adoptive mother -- who is also his great grandmother -- passed away. Now Re'Shov lives at a residential facility with other kids in the system. 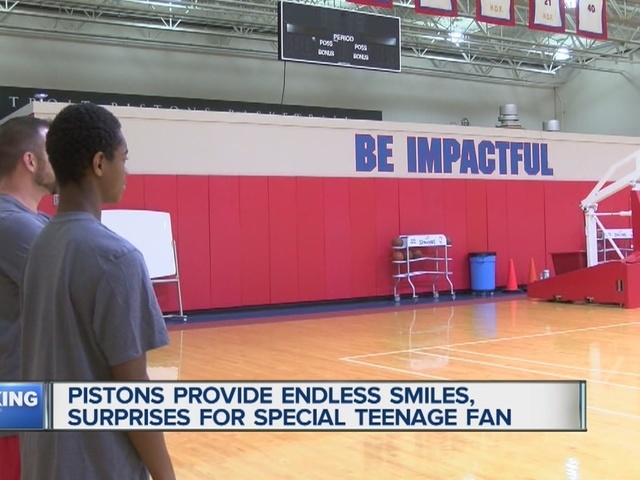 "It’s a kid who went through a lot of stuff and for me, really everybody in the gym,we all enjoy helping somebody out, making somebody’s day," said Pistons forward Stanley Johnson. Re'Shov will be back at The Palace for a game later this fall, and he's going to bring his roommate and his all the other kids he lives with along for the ride. "It’s my first basketball game to go to period, and now my friends and everyone I know, can experience that same thing I'm going through and see there’s always light at the end of the tunnel," said Re'Shov.